Gautama Buddha Rural Development Foundation, Delhi is going to arrange a one day seminar on career counseling for youths and students at Kali Asthan, Malik Sarai, Jahanabad Road, Islampur (Nalanda). Special Guest – Shree Ajay Singh (I.R.S. ), Mananiya Shree Kaushlendra Kumar (Member of Parliament, Nalanda, Bihar), Prof. Dr. Sanjoy Kumar (Principal), Shree Shristi Raj Sinha (B.A.S. ), Shreemati Tanuja Kumari (Chairperson, Jila Parishad). New Batch for all courses (civil services) has been inagurated by Ajay Singh (IRS), Dy. Commissioner, Income Tax Department and Dr. Sanjoy Kumar, Principal, B. D. College, Patna on 23rd of July 2017. New Batch for all courses (civil services) has been inagurated by Ajay Singh (IRS), Dy. Commissioner, Income Tax Department and Dr. Sanjoy Kumar, Principal, B. D. College, Patna on 23rd of July 2017 at branch office location. Gautam Buddha Rural Development Foundation, Delhi was established in 2012. GBRDF is a non-govt. organization registered under trust registration act 21, 1882, Govt. Regd No.- UITA 1882/1851 Govt. 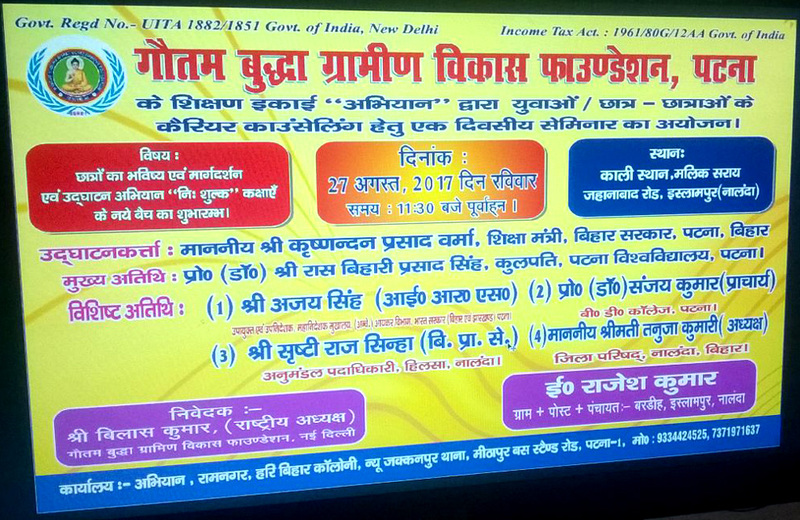 of India, New Delhi, Organisation is involved in so many welfare, development and seminar programme sponsored by govt., non-govt. and self like Women and Girls Welfare Programme, Women Education Programme, Environment Awareness Programme, Health and Sanitation Programme, Agriculture and Horticulture Programme, SC/ST Development Programme, Flood Control Teacher's Training Programme, Scholarship to student, Quiz Competition, Road Safety Awareness Prog. and Vocational Training on different Job Oriented Subjects. Beside these programme, other so many training and development programme is running right now. The main motto of our organisation is to all-round development of weaker section of the society and also provide Self Employment to them.